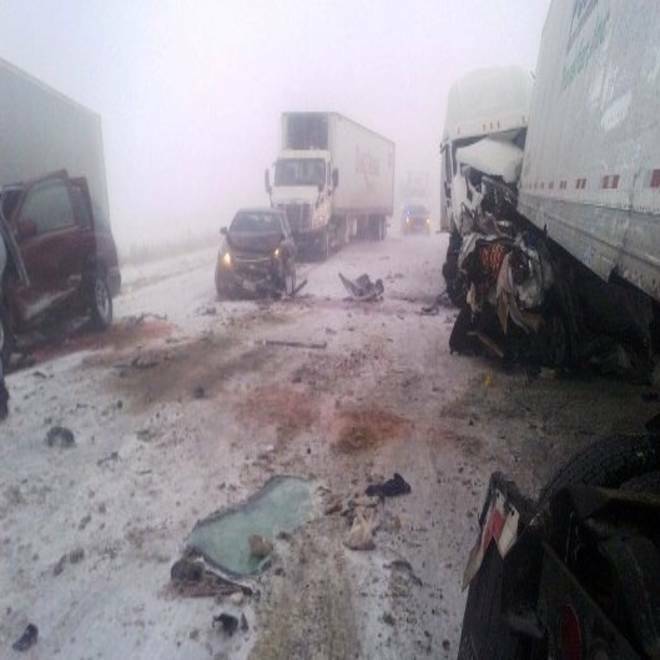 The powerful storm made for dicey driving conditions in Iowa, causing a 25-car pileup. In Wisconsin, the governor declared a state of emergency. And in the South, several tornadoes spawned from the same weather system. NBC's Kevin Tibbles reports. The first major wintry storm of the season hammered the Midwest on Thursday, causing a pileup in blizzard conditions that killed three people, dumping a foot of snow in some areas and creating travel problems during one of the busiest periods of the year. Those travel woes could extend into the Northeast, with high winds and rain expected there Friday. Nearly 600 flights were canceled at Chicago’s O’Hare International Airport on Thursday, according to FlightStats, and an additional 700 were grounded at Kansas City International, Midway (Chicago), Detroit Metropolitan, Minneapolis-St. Paul International and other Midwest airports. Southwest Airlines canceled all flights at Midway starting at 4:30 p.m. local time, NBCChicago.com reported. The storm system also spawned a tornado that flipped vehicles in Mobile, Ala., and cut power to 400,000 homes and businesses. Some 130,000 were still without power Thursday afternoon. At least six deaths were tied to the snowstorms: In Iowa, three people died Thursday in a pileup involving more than 30 vehicles on Interstate 35, NBC affiliate WHO-TV reported; in Wisconsin, slick road conditions led to two fatalities; and in Utah, a woman who tried to walk for help after her car became stuck in snow was found dead, officials said late Wednesday. Search and rescue crews on snowmobiles found her buried in the snow just a few miles from her car. Snow, whipped by 50 mph wind gusts, have been causing white outs and leaving residents in the dark. The Weather Channel's Mike Seidel reports. Blizzard or winter storm warnings were issued for 16 states on Thursday, Weather Channel meteorologist Mike Seidel told TODAY. Northeast cities can expect rain and high winds from the system Friday morning, said NBC meteorologist Bill Karins. Most of the snow should move into Canada Friday night. A foot of snow fell on Des Moines, Iowa, by early Thursday and residents across the state were urged to stay off the roads. "Because of the wind, travel is pretty treacherous, especially into Iowa, as the storm moves east," National Weather Service meteorologist Scott Dergan said. The snow cover will drag temperatures much lower in Iowa and Nebraska, he added. "We're talking single digits. We may even see some sub-zero temperatures in Nebraska. This cold weather will stick around for several days, maybe until the day after Christmas. So we're definitely going to have a white Christmas." Some of the vehicles involved in a pileup on Interstate 35 in Iowa are seen Thursday. Blowing snow led to school closures in parts of Iowa, Kansas, Missouri and Nebraska. All state government offices also closed in Iowa. Storms in those four states left around 130,000 homes without power. "Thundersnow" was reported in Iowa Wednesday night, as thunder and lightning accompanied the storm as it trekked across the state. 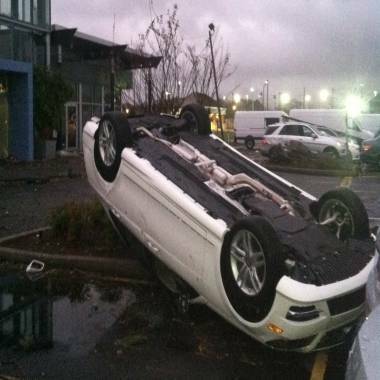 This vehicle at a car dealership was flipped over by a storm in Mobile, Ala., on Thursday, Dec. 20. In Alabama, a tornado peeled the roofs off homes and buildings and toppled vehicles in Mobile, but caused no serious injuries, Al.com reported. Arkansas also saw damage from high winds. The storm system earlier delivered heavy snow and strong winds to parts of the West, where trucks tangled on icy roads on the Oregon and California state line. In West Texas, winds from the same system kicked up a dust storm Wednesday that caused accidents along Interstate 27, resulting in one death and more than a dozen injuries, NBC affiliate KCBD reported. At Dallas-Fort Worth airport, American Airlines said it canceled about 120 flights Wednesday night due to the storm. In Nebraska, snow blowing sideways on Wednesday night forced the closure of a 146-mile stretch of Interstate 80, a major east-west highway. Much of the nation is dealing with a big blast of winter as a massive snowstorm barrels from the Rockies to the Midwest, with some parts of Colorado buried under more than a foot of snow. NBC's Mike Seidel reports. In Wisconsin, Gov. Scott Walker declared a state of emergency on Wednesday. Schools were canceled in advance of heavy snowfall and the University of Wisconsin-Madison postponed Thursday’s final exams. Before the storm, several Midwest cities had broken records for the number of consecutive days without measurable snow. In Chicago, people made a run on snow shovels and salt ahead of what should be the first snow to hit the city in 290 days (the record is 296). The storm has package delivery companies nervously checking the weather forecast during this busy time of year. "We’re closely monitoring the storm," FedEx spokesman Scott Fiedler told NBC News. "We have a team of 15 meteorologists who track the weather around the world every day." Along the East Coast, the I-95 corridor isn't expected to see much, if any, snow. "Snow may make it as close to New York City as Western Connecticut but right now, other than a few flurries Friday night, I think New York City through Boston will be mostly snow-free," Tom Niziol, the winter weather expert at The Weather Channel, told NBC News. "Areas to the southeast of the Great Lakes, from Cleveland through Syracuse will get heavier snowfall," he added. "Higher elevations from the Adirondacks through the western slopes of the Central Appalachians will also get snow." NBC News' Isolde Raftery and A. Pawlowski, as well as The Associated Press and Reuters, contributed to this report.